When VIPs hit the headlines with issues relating to trademark law, IP attorneys rejoice in providing know-how at social gatherings. This happened to the author with the recent news of a conflict between the well-known Irish MMA fighter Connor McGregor and the Dutch based fashion brand McGregor over – what else – the use of McGregor. As famous athletes do, Connor McGregor has launched a clothing line with the Reebok brand, which belongs to the adidas group of companies, and has also applied for registration of some McGregor marks as EUTMs. The Dutch fashion house McGregor, holder of several prior trademark registrations for McGregor, opposed the EUTM applications and brought interlocutory proceedings before the Dutch Court for trademark infringement. Adidas relies on the own-name defense..
On August 10th, the Court ruled in favor of the Dutch company. According to the Court, the fighter’s name is printed on the clothing in a very prominent manner; the first name ‘Connor’ has a marginal position, compared with the family name ‘McGregor’. Although McGregor is one of the highest earning athletes in the world, the general Benelux public is believed not to be familiar with him. Consequently, the public may perceive the use of the McGregor name on the clothing as a commercial connection between the involved parties. So, the Court ruled that adidas crosses the boundaries of fair use. As the name McGregor is identical to the invoked trademarks, the ruling was made against adidas. Yoko Ono, widow of John Lennon and holder of several trademark registrations for JOHN LENNON, was more successful in a matter against a Polish lemonade manufacturer. The latter marketed its products under the name ‘John Lemon’. 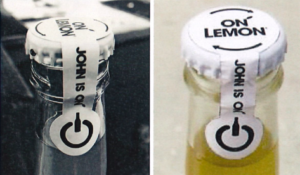 Although the parties appeared to have settled this conflict in 2017, when the device mark ‘John Lemon’ was transferred to Ms Ono, the lemonade was still being sold under the name ‘ON LEMON – JOHN IS ON’. Moreover, contrary to the settlement agreement, references to ‘John Lemon’ were still visible on social media and were printed on boxes containing the lemonade bottles, as well as on the label, referring to the manufacturer. This led Ms. Ono to start legal action against the lemonade company after all. According to the Dutch interlocutory ruling, the sign JOHN LEMON is confusingly similar to the name of the legendary Beatle. Further, the subsequently used ON LEMON – JOHN IS ON is believed to be similar as well, because of the link with the formerly used sign JOHN LEMON. The Court ordered a recall and rectification. Even without using the actual name of a famous person, trouble may await. A Dutch online supermarket used a lookalike of Formula1® driver Max Verstappen in a one-off online video commercial. Dressed in the Red Bull team race suit, fake Max delivered groceries to customers. According to the Dutch Court, the use of a lookalike in the commercial infringed Verstappen’s personality rights. And although the infringing video was only published on the Facebook page of the company, and for a limited period of time, the online supermarket was ordered to pay an amount of 150,000 EUR, in particular due to the commercial value of Verstappen’s personality. As is clear from the McGregor case, it is not only the VIP’s who are forced to defend their IP rights; sometimes it is the other way around. So, for trademark holders it is not only important to check new trademark applications, but also to monitor whether there may be upcoming athletes, popstars, influencers and the like with resembling names. As for the McGregor case, this is just an interlocutory ruling, it does not mean a knock-out yet. We will see if there is a second round.